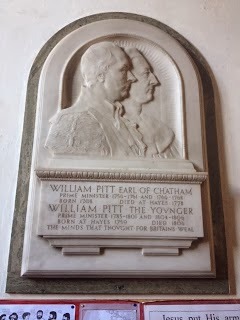 Tucked away in a corner of the church there is a memorial plaque to William Pitt the younger, and his father William Pitt the elder, 1st Earl of Chatham, at St Mary the Virgin in Hayes, Kent. Pitt the elder had a house, Hayes Place, that once stood across the road directly opposite from St Mary the Virgin church. William Pitt the younger and his older brother John Pitt (2nd Earl of Chatham) were born at Hayes Place, and the five children of Pitt the Elder grew up there and at the family estate of Burton Pynsent in Somerset. Sadly, Hayes Place was demolished in the 1930s. Of interest, Winston Churchill (Prime Minister during the Second World War) was a huge admirer of Pitt the younger. I fully intend to explore Churchill’s interest in Pitt in a future blog entry. Churchill was one of the subscribers to this Pitt plaque, and the memorial was placed in the church in 1929 by Lady Stanhope.